All our above-ground swimming pool packages ship for free unless otherwise mentioned. We ship every pool-package with freight companies all of the local United States. We ask our shipping partners to arrive with a power tailgate so they can lower the pallet(s) down to the ground for you. This service is called driver assisted power tailgate. Most drivers are friendly and accommodating, but they are not responsible for bringing your pool where you want, just to deliver it to your address. In rare cases, you will be asked to get your above-ground pool kit from the closest shipping terminal, or the trucking company may agree to meet you somewhere more convenient. 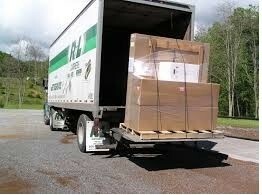 Private pickup is usually due to the roads or bridges leading to your property not being insufficient for our carriers. The shipping company will call you to arrange delivery, if you have any concerns because you live in a rural area, please discuss them while you have the company on the phone trying to coordinate the delivery with you.